In this DIY guide our experts show you how to build a shed. Find out how to build sheds, a playhouse or outbuildings with step-by-step shed building advice and tips covering building a garden shed, felting a shed roof, alternatives to traditional felt shed roofs and fitting shed windows. Whether you're building a simple garden shed or a "Global Shed-quaters" the building principles are the same! How big do you want your shed – the size of your shed should compliment the size of your garden. Try not to overwhelm your garden. Think about the colour and aesthetics of the shed. The shed needs to be accessible with a pathway and a sensibly placed doorway. Placement of the shed is important, your shed should not be in an awkward position, rather place it where it is out of the way but still accessible, a good place is often against the back or side wall – perhaps the corner. Natural light is an issue in winter? Choose the correct side for the window/s to provide maximum light. Is there a danger of overheating in summer? Is the shed going to be powered? How will you get the power to the shed? Think underground cables. Do you need running water in your shed? Is there a tap nearby where you can source water? Try and make your shed versatile – a children’s playhouse can later be made into a workshop or storeroom when they grow up. A garden shed is fairly simple to build. There are obviously more elaborate options with extra windows and double doors, but most are standardised. Some sheds are even wired and heated. Proper heavy duty locks can be fitted for extra security. To begin with you will need to lay a base slab; the slab should be 25mm smaller than the floor of your shed, to ensure proper drainage, for the same reason the slab should also be slightly tilted to allow for drain off of any water. For more information on laying a shed base slab see our Building a Shed Base project. Once you have your slab in place you need to centre the shed floor on it. The centre points of the side panels and the floor should all be marked so that they will line up in the next step. Lift the rear gable panel and put it in the correct position at the rear of the shed using poles to prop it up. Now you can lift any one of the side panels onto the base and position it up to the gable end panel. The gable end and the side panel need to be connected using the framing battens (either supplied with the kit or already fixed to the panels) where they meet. Drill 3 pilot holes then fit 50mm countersunk screws to join the gable panel and the side panel at the top, middle and bottom. After tightening the screws between the gable end panel and your chosen side panel, the other side panel can now be fixed in the same manner. The front gable (with the door) is next but once fixed to the other panels to create the basic framework of your shed you shouldn’t attach the walls to the floor as the frame is not rigid yet. With the shed now taking shape, it’s time to fit the door (if it’s not already fitted). You should have two hinges with the kit. Place the door face up on the ground with the front facing upwards. Look on the rear for the position of the top and bottom ledges (the pieces of timber running horizontal and joining the sections of the door together) and see if there are any pre-marked screwing points (small holes) and do the same on the outside of the front gable end of the shed. If there are then these are the points that the hinge should be screwed to. If not, firstly position the hinges on the front of the gable end and screw them on, making sure that the hinges are fixed square and that the joint of the hinge is just on the lip of the door opening (so that the door doesn’t bind) and also that their position lines up with the ledges on the inside of the door so that you can screw into them. Now you need to position the door within the opening with the hinges on the outside (You may need an extra pair of hands here). Position the door in place ensuring that the gap around it’s perimeter is the same and screw the hinges on starting with the top first and checking that all is square as you fix each screw in. Once fixed check that the door opens smoothly. If not you may now need to adjust the position of the hinges and screws. The roof support beam is next to be fixed and this will now start to give your shed some rigid stability and somewhere to fix the roof to – there should be pre-cut grooves in both the front and rear gable ends for the beam to slot into. Before fixing the beam to the gables, make sure that the shed is evenly set on the floor and that the door opens smoothly without any hookups or binding. Fix the beam on to the gables by using the L-shaped brackets and 30mm screws. Before putting the roof on, Lay the roof panels on the ground, one at a time, with the wooden eave sections flush with the bottom edge of the panel. Measure and mark six evenly spaced fixing positions. Drill some pilot holes and then you can screw and attach each of the eaves to the roof panels. Lift the roof panels into place one at a time. Line them up with the shed frame on the base using the centre markings. Secure the roof panels with 30mm screws along the roof support beam. You can now fix them to the sides and the gable ends of the shed using the 40mm nails, or 30mm nails across the window heads and along the top edges of the gables. Finally check again that the shed is square on the base before finally fixing the shed to the floor using the 50 mm nails or screws. To check that the shed is square, the best tool to use is a framing square to check each corner of the shed or you can use a tape measure to measure the internal angles of the shed. 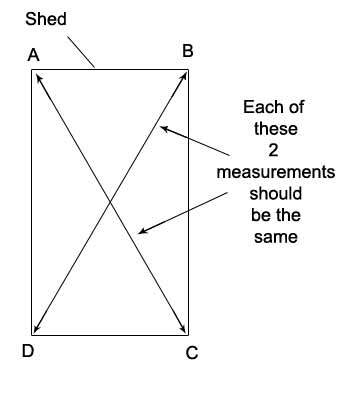 Mark out the four corners of the shed in a clock-wise direction by giving them each a letter – A, B, C and D. Now measure each diagonal angle to the corner between points A and C and points B and D. The idea here is that each of these two measurements should be the same and once they are this will give you your square shed. Adjust corners C and D until both the internal diagonal measurements are the same. Again, you may need an extra pair of hands to assist you with this. You will need to cut the felt to size with a sharp blade (Stanley knife or similar). Cut three pieces, two of them should be slightly larger then the roof panels (+50mm) and one of the pieces should be cut to cover the gap at the apex and extend at least 75mm over each roof panel. Ensure that you measure each roof panel to get it’s exact size. Lay one of the pieces over one of the roof panels and nail it on using felt nails. At the top of the panel there should be a 50mm overhang at the eave. Neatly fix the gable ends and eave ends with closely spaced (100mm) felt nails. With one roof panel now felted repeat the process for the other roof panel, again measure the panel to find out it’s exact size and cut the felt slightly larger as suggested above. Put the third piece of felt over the gap at the apex and ensure that the overhang at each end is the same and nail it down using closely spaced felt nails. It’s also a good idea that once all the felt is fixed into position to go back over it and add additional nails where you can. In high wind situations roofing felt can easily be ripped from a roof if it is not secured. Tidy up the felt at the corners, trimming them up if needed and nail the fascia board on the front and back gables using 4 x 40mm nails per strip. Another consideration when roofing your new shed is how accessible it is – at some point you may need to replace the felt. A long lasting alternative could be rubber roofing. Available as one piece of membrane cut to size, there are no joins or overlaps to worry about. If your felt roof leaks, it can be very difficult to firstly see where the problem is and even more difficult to patch. Rubber roofing may seem a little odd for a shed, but will alleviate all these worries. DIY rubber roof kits are widely available today and the kit should include everything that you will need in order to cover your shed roof with a long lasting, EPDM rubber membrane (that also features a lifetime membrane guarantee), including the adhesive, trim and full installation instructions. The membrane is glued to the shed roof using a totally safe, water based adhesive and due to the fact that it doesn’t feature any joints that could fail and cause leaks, you can be sure that these issues will not arrise in the future. A further benefit is that they should also be completely UV stable, so no degrading of the rubber over time. Most shed windows nowadays are Perspex or acrylic, which are very easy to install and obviously cheaper and safer than glass. They slide easily into their housing in the window frame. You need to be outside to begin installing the windows. Firstly slide the metal window sill (should be provided with your shed kit) into the grooves provided at the bottom of the window frame. Nail in the short strips of wood known as window cloaks, using four 40mm nails in each. This will secure the sill. Now from inside you will be able to slide the Perspex into the frame so that it is resting on the sill. Secure the beading with 25 mm nails. Position the beading over the perspex sheet at the top and sides of the frame and hammer them fully home. Again like the felt, once in position it may be worth going back over and adding additional nails for further security to prevent high winds blowing them out. You should now be well voiced in how to build a shed and the principles of this job can also be translated over to the construction of many other structures such as playhouses and outbuildings. Why not take a look at our video section on building a shed to watch a film on shed building for a practical demonstration.